I get this question a lot. I contract out my development services to companies who need Mac, iPhone, or iPad software designed and developed. Many of these companies have lots of Windows developers on board full-time and contract out their Mac work so I understand that all-things Mac are new to them. But this question always comes up. Always. I decided to blog about it because most people don’t know the name of the tool and can’t “Google” for it without stumbling across scripts to accomplish this task. Apple includes a command-line tool called agvtool which handles my versioning needs. It’s not perfect, but it does what it needs to do and when used in a corporate environment with a build system, it’s fantastic. What is it? In a nut shell, it’s a very focused “Find and Replace in Files” command-line tool. It searches through your program’s Info.plist file as well as the project .pbxproj file and updates them. You can even have it commit it’s changes with version control if you’re using Subversion or CVS. Want to change the marketing version to 1.1? Lastly, we need to update the Info.plist file. You need to set two values in, your Marketing Version is the Bundle versions string, short. If you don’t have this option in your plist file, select an item in the list and click on the + off to the far right. You can then select it from the list. The Bundle version is the build number. 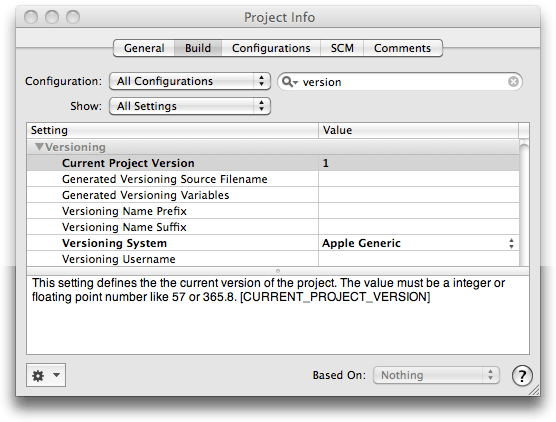 Set this value to match the one you placed in the Project Settings option for Current Project Version. The -usesvn parameter is optional. For an official build, you’ll want to commit the files that were changed by agvtool. Since agvtool went and changed the .pbxproj file while you had it open in Xcode, you get this. Simply click on “Read From Disk” and you’re back in business. More of an annoyance than a show-stopper.